mistypath, originally uploaded by jahansell. It's been a remarkably cool summer, but today was brutal - quite hot and intensely humid. The mist hung heavy over the fields, where you can see the beginnings of reds and browns - at Mudge Pond the changing leaves are remarkably noticeable and, I think, unusually early! Fabulous photo! It's been similar here...almost wintry weather all week but yesterday the sun shone temperatures soared! Off came the jumpers and on went the shorts! I've noticed here in the UK that the Autumn colours are starting. 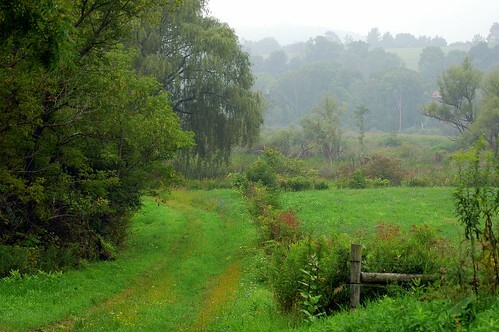 Great photo; so evocative of late summer in New England. Reminds me somewhat of the scenes around the Great Smoky Mountains. Nice photo. I can feel the heat just looking at this! Wonderful photo. I am surprised you haven't published some of your photos. Again, this makes me homesick for New England. I am glad to be able to again read your blog, it missed much, the countryside is really very beautiful and your photographs always make me dream. Know you Cornwall?